It’s finally fall! Which means it’s time to break out the winter candles, holiday cookies, and of course, fall outfits. It didn’t feel like fall (but maybe because it was still 80 degrees in Florida last week…) until I switched out all my brightly colored summer clothes for my warmer wardrobe. I’ll be the first to admit that I have way too many clothes. I’ve been working on cleaning out my closet with each season-switch since starting college. I’ve even consulted Pinterest for closet-clearing tips to get rid of things I didn’t/won’t wear to sell (I like to use Poshmark, and you can use the code ‘kristenbarry’ for $5 off your first order when you sign up!) or give away. When shopping for new things, I look for pieces that are versatile and stylish (and things that won’t be in the “out” pile by next season), like this warm and cozy red sweater from Shein. As soon as I tried on this sweater (and posted about it on my Instagram), I knew I had to create a few fall outfits with it. It just recently started getting chilly here in Tallahassee, even if it was 80 degrees when I shot these pictures! I’ve already worn this sweater a few times (like for Clemson FSU game-day this weekend!) and I know it’s gonna be on repeat all holiday season. These outfits could easily be recreated with your favorite cozy sweater, but I hope these looks help get your ready for fall! This look is perfect for just about anything, from heading to class to going out for brunch! My original idea for this outfit included my favorite brown riding boots, but I swapped them for my go-to Tory sandals because of the warm weather. This Tory tote was my best Poshmark-find so far, and I scored it for 70% off, in almost perfect condition. I’ve never been a fan of backpacks, and I’ve been using this tote for classes every day. For reference, it’s the ‘large’ Ella tote, and it perfectly fits my 15” laptop. This look is super comfy, and basically my daily attire for going to class. A good, well-fitting pair of yoga pants, or two, or four, letsbereal, is so important for the college girl’s wardrobe! 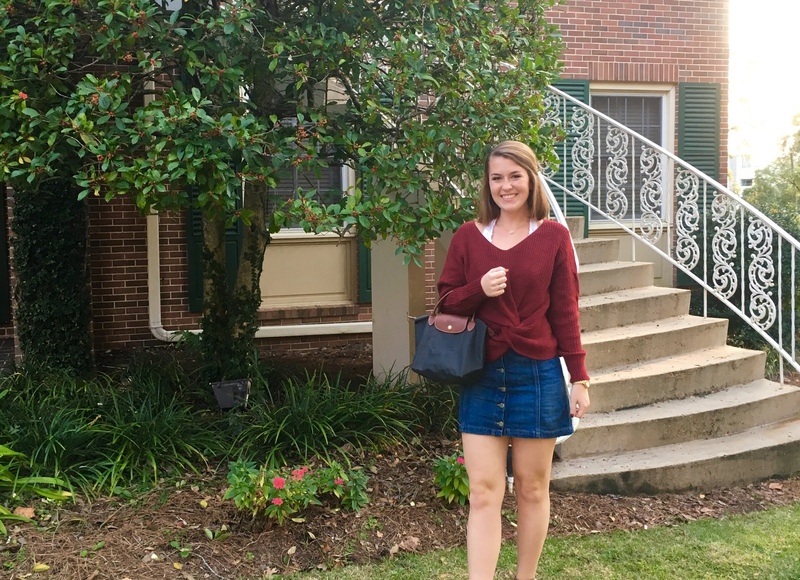 I am all for wearing yoga pants, a t-shirt, and sneaks to class, but recently I’ve been loving pairing my yoga pants with a cute top for this easy outfit! This outfit is basically what I wore for the FSU Clemson game this weekend. But instead of these ahh-mazing Dr. Scholl’s slip-ons I found at DSW, I stayed warm with boots and a jacket. I wore this outfit running errands the other weekend, and you really can’t go wrong with it! The sweater and bralette make an otherwise PJ-level-comfy outfit look effortlessly-chic. This look might just be my favorite! I posted a similar outfit on my Instagram recently, and I’ve been loving styling denim skirts this year. These heeled booties were another item on my Fall wish-list, and I finally found the perfect pair from ShopHopes.com! I’ll probably sport a similar look to this for Thanksgiving/my birthday dinner/ all-the-occasions. A skirt might not be practical for super-cold weather (if ya don’t live in ever-warm-and-sunny-FL). In that case, I’d recommend adding tights and a scarf for extra warmth. A big thank you to my lovely friend and Gamma Phi sista Sloane for being my ever-so-patient photographer for this post! Be sure to check out these fall outfits on my Instagram as well, (or shop them all here!) and hit that “follow” button for my blog if you haven’t already! Love these ideas! Being so busy, I usually just throw on some of the first clothes I can find, but you have made me want to put a bit more effort into fun sweaters and feel-good outfits! I’m the same way! I’m so glad I could help inspire your outfits! I love sweaters because they’re so comfy, but so easy to make look somewhat put together without really trying! Wow, such creative ideas! Thanks for helping inspire my wardrobe!